It’s time to show the world what it means to party like a mother . . . THIS EVENT IS SOLD OUT! JOIN THE LIST BELOW TO BE FIRST TO THE PARTY NEXT TIME! Champagne generously sponsored by The Woodhouse Day Spa will started being poured promptly at 6:00pm. Come on time so you’ll have a chance to grab a glass of bubbly and meet some new friends before everyone sits. We’ll gather for the “Honest Conversation” at 6:45pm where Gervase will interview Kim and Beki about what it REALLY takes to balance business and motherhood in her signature real coaching style. More mingling, drinking and perusing the spa from 7:30-8:00pm! The Woodhouse Day Spa will be offering 20% off gift cards and retail purchased that night! Beki Crowell will have her soul art for purchase! See her work here! Authors of the book, Gracie Brave, will be onsite for a book signing. Read more at graciebrave.org. Kim is the mother of three sons, Buckley (24), Bowen (22) and Christian (19) and just became an empty nester...sort of... all of her boys now reside in Charleston, just not at home. She graduated with a B.S. in Computer Science and a minor in Philosophy from the University of Dayton, where Kim is from. She and her husband, Keith, have been married for 28 years and own several companies together. Kim is an owner of Summit Industrial Flooring, Summit Real Estate, Woodhouse Day Spa, Woodhouse Regional Development, Women’s Wellness Weekend and Heron Fragrances. She is an investor in Beacon Bank & Implace Impact, both located here in Charleston. She is active in philanthropy and mentors at the College of Charleston’s School of Business Impact X program. Beki is a mother of three young men, Chaz, Noah and Kai. She is a Soul Artist, Vibrational Healer and writer. Beki and her husband, Sherman Evans have owned the creative and magical boutique and gallery, UTOPIA, on Broad Street, downtown Charleston, for 27 years. Her role as a mother has been the most powerful catalyst for her spiritual evolution. Her spiritual memoir, Bare Beauty: My Journey of Awakening, to be released this Fall, shares some of the awakenings that mothering has inspired. Introducing our new champagne sponsor . . . 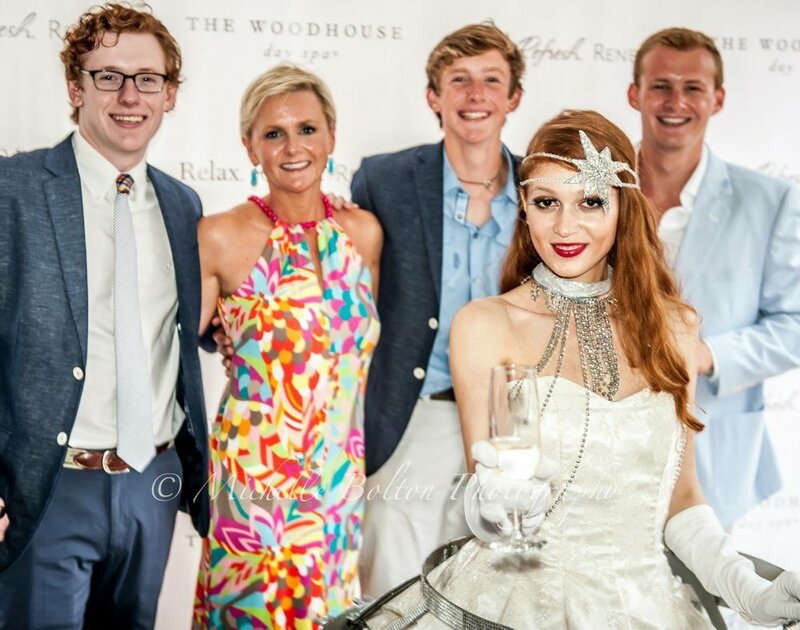 Experience The Woodhouse Day Spa, Charleston's ultimate, full service, luxury day spa, just minutes from Charleston. The distinctive Woodhouse standard goes beyond your expectations, providing outstanding facilities and treatment therapies with your overall health and wellness in mind. In today’s hectic lifestyle we often do not take time for ourselves, so RELAX CHARLESTON and let the first steps you take to the perfect balance of beauty, health and wellness, be the ones that bring you to the experience at The Woodhouse Day Spa.